MOSCOW (Sputnik) - US President Donald Trump in a Sunday interview with the CBS News broadcaster did not rule out that he might ask Russian President Vladimir Putin to extradite 12 Russians indicted as part of a probe into Moscow's alleged meddling in the 2016 election, noting that he would raise the issue itself during the upcoming summit. "Well, I might. I hadn't thought of that. But I certainly, I'll be asking about it. But again, this was during the [Barack] Obama administration. They were doing whatever it was during the Obama administration," Trump said when asked whether he would discuss the issue with Putin. The United States, in the meantime, has no extradition treaties with Russia, which probably determined Trump's answer that he "hadn't thought of [an extradition request] that." He noted that there were also some attempts to hack the Republicans, but they had superior cybersecurity systems to the DNC, while the latter "should be ashamed of themselves for allowing themselves to be hacked." Trump also stated that he went into the Helsinki summit "with low expectations," adding that something good might still come out of it. "I think it's a good thing to meet. I do believe in meetings … Nothing bad is going to come out of it, and maybe some good will come out." On Friday, US Deputy Attorney General Rod Rosenstein announced that the US Department of Justice, as part of the so-called Russia probe, had brought charges against 12 Russian citizens, who allegedly worked for the Russian intelligence service. The individuals are accused of hacking the Democratic National Committee (DNC) and presidential candidate Hillary Clinton’s campaign. The statement comes in the run-up to the Putin-Trump summit in Helsinki, slated for Monday. 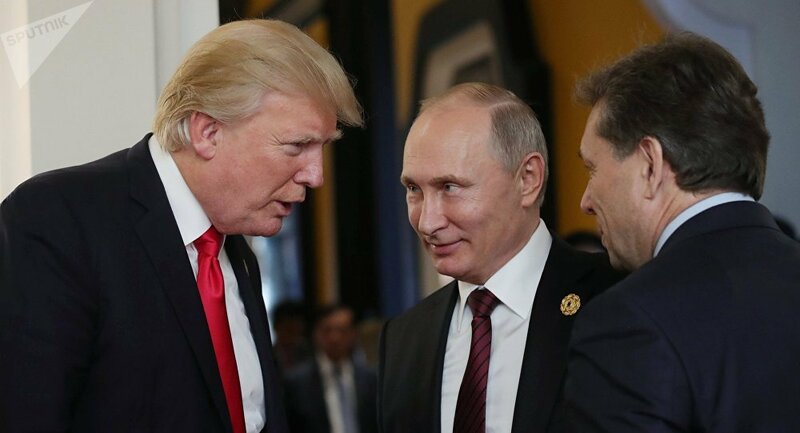 Since Trump won the 2016 presidential election, the US authorities have been investigating on various levels the allegations about his campaign team's possible collusion with Russia, and have claimed that Moscow meddled in the election process to help Trump win against then-Democratic nominee Clinton. Both the Russian authorities and Trump have repeatedly refuted the allegations of collusion as groundless.